REFUSE TO BE INTIMIDATED. The world of wine is populated with a few, well, snobs. There are people whose income depends on you, the consumer, feeling like you don’t know enough to order a wine you will like. There are some whose income depends on getting you to buy a wine whether you like it or not. There are also few who want to make you feel uncomfortable just for their own ego gratification. That said, there are also lots of folks who can and will help you feel more comfortable. These can include wine stewards or waiters in restaurants, employees in wine shops and at large retailers like Costco, tasting room employees, and, yes, wine bloggers like me. Take advantage of their knowledge and willingness to help. Even with the first group, you will usually find if you ask a couple of clear questions and let them know what you like and what you are willing to pay, you will get what you desire. There are three main reasons that cheaper wines have more additives than more expensive wines: One, consumers of cheaper wines tend to want their wine to taste the same every time. They are not interested in seasonal variation – the kind based on weather which affect wine grapes from just about everywhere. So, additives can mask changes – and in cheap wines, the issue is not seasonal variations; most are bulk wines, made from whatever grapes or juice are available at that moment from any location. Second – additives can make a rough product taste smoother, smell better, look better. In other words, mask problems. Third – there are economic reasons to use additives in some products, and your health is not one of them. 5. LEARN HOW TO SHOP FOR WINE. I often go into wine shops without intending to make a purchase – just to look around, familiarize myself with the kinds of wines available, the labels, the price points. I may engage someone in the shop in a conversation about a specific wine, or a wine region that they feature. And, truth be told, much more often than not, I walk out with a bottle or three. 6. LEARN HOW RESTAURANT WINE WORKS. There are a few things to be aware of when ordering wine in a restaurant. One is the pricing structure. The norm is to mark up a bottle two to two-and-a-half times retail cost. Many restaurants are offering wines at a lower mark-up (in Europe it is often the same as in a wine shop). Wine is a significant part of the profit structure at many restaurants. For others, it is an afterthought; the wines may not even go with the food offered. There are myths about ordering wine in restaurants. Most are false or only partly true. The reality is that if wine is a serious consideration in a restaurant, the wine list will have been chosen with care based on what is important to that restaurant’s management. It might be by region – focusing on Italian wines in an Italian restaurant; or by type of food served – an emphasis on white and rosé wines in a seafood restaurant; or it may be wines selected for the specific items on the menu. Some say that the best buy is the 2nd cheapest wine on the list. This is almost never true. If it is good value you are seeking, a good choice is to order a bottle of one of the wines they are selling by the glass. These wines are usually a good value and they are sold by the glass because they are well-received. Restaurants Want You To Be Satisfied. 8. LIFE IS TOO SHORT TO DRINK BAD WINE. I know you have a budget, which, like mine, is limited. And maybe you don’t have an educated palate to justify really expensive wine. However, as I noted above, just about all of the really cheap wines are filled with additives and are bad for you. So, think about how much wine you drink and what it would take to get the average cost per bottle up to $15 or more. At that price point, generally speaking you are drinking wine, not just a mixture of random grapes made in bulk. You will notice qualities like minerality, or terroir – the effect of the soil on the wine. You will begin to tell varietals apart ($7 Cabernet Sauvignon tastes surprisingly like $7 Merlot). And you will be drinking a more healthful beverage. 9. WINE ENJOYMENT IS SUBJECTIVE. No matter what the experts tell you, for 95% of wine consumers – the ones who haven’t trained their palates for years and taken rigorous certification classes – wine enjoyment is subjective. You either like a wine, have a “meh” reaction, or don’t like it at all. Robert Parker can’t tell you if you will like a wine. I try to look at tasting notes only after I have tasted a wine, to see if they got it right for me. There are things to know about specific wines, but, let’s be realistic, most who drink wine will never invest the time and energy to learn more than a few of them. Swirl the wine in the glass and look at the color; put your nose to the glass and sniff the bouquet; if it smells like something you want to put into your mouth, take a sip; if it tastes like something you want to swallow, swallow it; notice the finish. If you begin from there and add some knowledge as you go, you will never get to a point where Wes’s advice doesn’t hold true. With Wes Hagen AFTER a Tasting. 10. HAVE FUN WITH WINE. Wine is both a beverage and, for some, a lifestyle. I love sharing a good bottle with friends and family, and almost never have an expensive (say over $30) bottle when alone. Dorianne and I used to have wine dinners, where we would ask our guests to bring a special bottle, like the one they’ve been saving for a special occasion for ten years, and a dish to accompany it. At the dinner, each guest will tell the story of their wine as everyone shares it. Or bring a bottle from a trip and share the story of the trip. Go wine tasting when you travel near wine country – there are hundreds of “wine countries” these days. We have tasted in Mexico, Hungary, Poland, Ukraine, England, and in Michigan, Maryland, New York, Virginia, and Texas, to name a few outside of the normal wine destinations. You will meet some great people in the local wine industry, and fellow tasters are often interesting as well. I am sure that there are other guidelines for enjoying wine. These are my top ten and I hope you find them of value! Since moving to Lyon, France this past summer (LINK to Post About Moving to France), much of our time has been spent attempting to learn French (definitely a work in progress), finding our way around town (easy as Lyon is a very walkable city with great public transportation), and traveling back and forth to the US (which will become increasingly less frequent). View toward Vieux (Old) Lyon across the Saône River. I will do another post as a sequel to the one about moving to France soon. For now, let’s talk wine. Lyon is located in the Rhône-Alps Department (there are 100 departments, or states in France), in the upper part of southeastern France. We are just north of the Rhône Valley at the confluence of the Rhône and the Saône Rivers. A few kilometers to the north, Burgundy begins with the Mâcon region; to the west, Beaujolais is a few kilometers outside the city; to the east, the underappreciated Jura region is a short drive away. Wines from all these regions and more pour into Lyon, a city of about 500K with 2.2 million in the metropolitan area. There are only two large supermarkets in the city limits, both at malls. Big box stores are restricted to outlying areas, meaning that mom & pop businesses thrive. Every neighborhood has multiple small boulangeries, boucheries, fromageries, green grocers, and wine caves. Small grocery stores have wine departments featuring representative wines from the surrounding regions, mostly from larger producers. The caves (wine shops) have more wines from smaller producers and a few higher-end bottles, but almost all the wines are reasonably priced and would qualify as “everyday wines.” (LINK to @EricAsimov column on Everyday Wines from the NYTimes). We are drinking these wines for the most part with our lunches and dinners at home – spending an average of 10 to 12€ per bottle (top shelf at these stores) – sometimes much less – and enjoying most of them very much. This is why I have not been blogging and Tweeting as much about the wines I am drinking – they are, for the most part, not stand-out wines, but they are good! My admittedly limited personal research thus far has revealed an interesting fact: THE FRENCH DON’T LIKE TO SPEND A LOT OF MONEY ON WINE. I don’t know why this surprised me – but I just have not encountered the kind of wine conversations that I had with friends in California. It is more likely to encounter a boxed wine at a dinner party than a higher-end Burgundy or Châteauneuf du Pape. And, by the way, I have had some very drinkable boxed wines here. But I was a bit surprised that the Mecca of fine wine is largely populated with folks who prefer to spend under 10€ a bottle (and 3€ can get you a very nice rosè from Provence). Even when higher-end wines are served at dinner, the conversation is not about the wine. Perhaps a quick recognition of whoever provided it (usually the host), but that’s about it. Dorianne and I eat at restaurants once or twice a week. Lyon is a gastronomique capital – many of the great Parisian (and New York) chefs train in the many cooking schools here. Lyon has more Michelin Star restaurants per capita than any other city, so food is a big thing here. And this extends downward from the Michelin restaurants all the way to the Bouchons (think bistro but serving Lyonnaise cuisine) and comptoirs. It is difficult to find a bad meal here, and some very nondescript looking places are working magic in their tiny kitchens. And as for wine, once you get out of the Michelin range, the wine lists tend to be fairly modest, featuring value-priced bottles and vins de la maison, usually from a tap or box. The wine list prices are usually at regular retail or just a bit above. So, my everyday wine experience here in Lyon has been mostly with everyday wines from the wine regions surrounding the city. I will say that French wine producers seem to understand that the French don’t like to pay a lot for wine. The 13€ Burgundy Pinot Noir I get at the local wine cave tastes equivalent to a $30 or $40 bottle of Burgundy purchased in the US. We are enjoying very good wines for very reasonable prices – and feeling very grateful in the process! Don’t believe me? Come visit and see! Dorianne and I are happily ensconced in a nice AirBnB.com apartment in a beautiful village called Villanueve lès Avignon, just across the Rhône River from Avignon. We will be here for six weeks, so five to go. 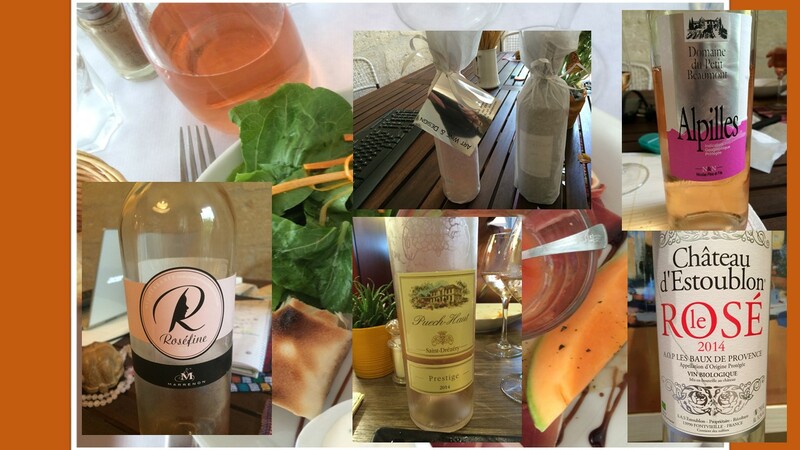 It has been pretty hot here, as is normally the case this time of year (think Southern California with a bit more humidity), so we look for refreshing meals and refreshing wines, which has, for the most part meant rosé wines. Of course we have had some whites and a couple of local reds (they chill them here in summer) from the Luberon, Languedoc-Roussillon and Province, but rosé has been our go-to wine 3/4 of the time. They have been good with lunch, with our late afternoon wine-cheese-and-olive snack (all local, of course), and with our dinners. We have paid from 4 euros to 17 euros per bottle, and found very little difference in the quality of the wines. Some are a bit sweeter than others, some need to be really cold to drink well, but the degree of separation for most of these wines is minimal. A Collage of Some of the Southeastern France Rosés We Have Had. One rosé from Corsica’s (LINK) Vin de Course AOC had Nielluccio, Sciacarello and Grenache as its varietals (not pictured). The wine was a delight and cost 4.50€, or about $4.80 for a bottle. But mostly, we are drinking the wines of the regions that abut Avignon, which include Luberon, Languedoc-Roussillon, Chateauneuf du Pape, and Provence. I am not sure which, if any of these wines are available in the U.S. or other countries. All I can say is, this summer if you can get your hands on rosés from Southeastern France, do it. We will be touring some local wineries and regions over the next few weeks, so look for more posts about this magical place.